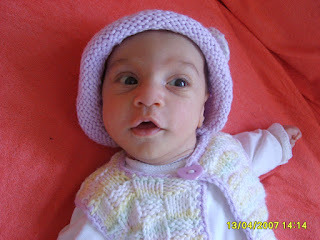 Grandma's Knitting Place: Here is Adem! 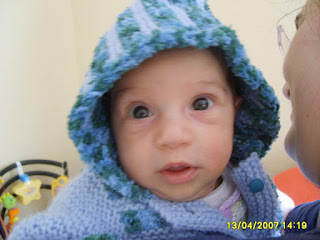 This is Adem in Turkey - born on February 26th 2008! 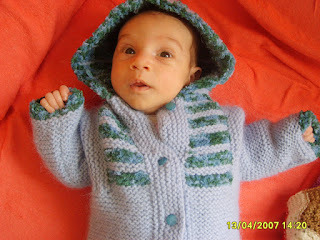 He is wearing the little Tomten and Summer Set I made him! They are a little big for him - but I am sure he will grow into them pretty fast! His mother is Ferda and is an internet knitting friend of mine. It looks as if he will be wearing that little sun hat for years! Tomten with button closing - sounds good to me; I finished knitting weeks ago, bought a zipper but have baulked at putting it in. Think buttons are definitely the go!! We all think Adem is gorgeous!! Hey gal...that little sleeveless vest Adem has on..would love to know what pattern it is! Adem looks so warm and snuggly in his sweet outfits! 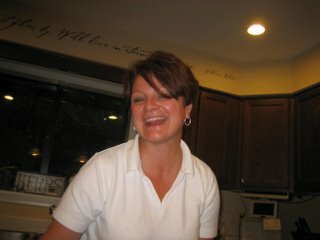 Yvette - thanks for stopping on over to my blog! The tufty things in the bucket (soaking) are corn shucks. They take them after they've softened to stick in the holes of the wooden pieces to make corn shuck brooms. I think I'll add it to my site, so everyone will know! Grandma's Knitting place is just the greatest. This lady is been just the best. I have found her to be very helpful & is very kind to pass on her knitting patterns & advice. Please check her site out she is a great lady. Many thanks, & happy knitting & creating.